At Viera East Veterinary Center, we recommend performing basic lab tests at least once a year, as well as reviewing nutrition and any behavioral issues you may be noticing. Of course, we realize that some cats don’t like getting into the cat carrier and going for a ride. In these circumstances, we recommend coaxing your cat into his carrier by using a treat, and trying to soothe your kitty during the car ride. We can also recommend soothing pheromones or scents to lessen their stress while travelling to the appointment. Cats should have a thorough dental cleaning around age 3 to 4. We will do a dental exam and look for any abnormalities in the mouth. By age 4 virtually all cats have some kind of painful dental issue. In addition to problems with their teeth, cats can develop tumors inside of their mouths and since they are so adept at hiding pain, especially dental pain, it is very easy to overlook these issues. However, make no mistake, dental issues are painful and seriously affect the quality of life. 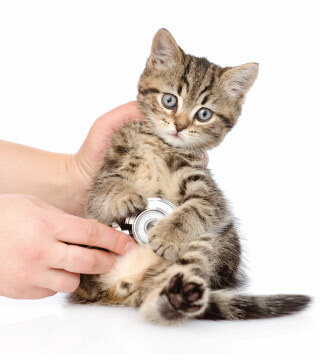 At Viera East Veterinary Center we assess the body condition of the cat, and determine if he is the correct weight. A wellness exam also includes palpating the abdomen for organ size making sure that all is normal and checking for any lumps or bumps. We will also collect urine and blood samples for yearly labs. Preventative care is extremely important, along with vaccines, parasite control and deworming.